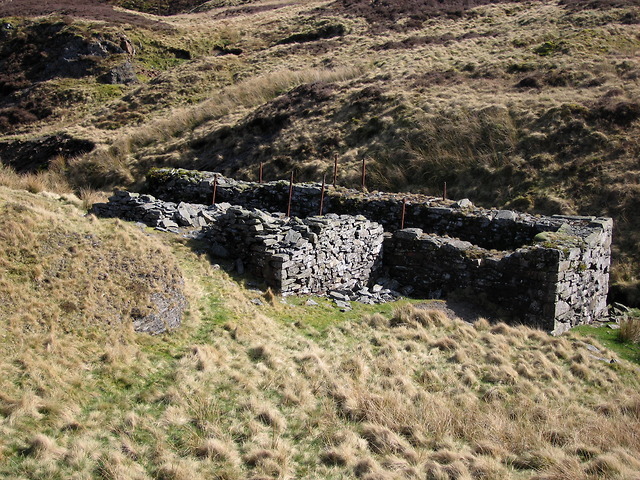 This structure once housed a water wheel, driven by water taken from the Nant Ddu (and supplemented by a leat carrying water from the Nant Goch). The power generated here would have been transmitted mechanically to the engine house Link next to the shaft Link of the mine a short stretch upstream of the Nant Ddu. The function of the structure attached to the side of the wheel pit Link is not entirely clear to me at present. It would seem reasonable that the crank driving the flatrod system to transmit power to the engine house would have been housed in it, but I cannot see an opening for the mechanism to emerge from. The wheel pit is listed on the Coflein database Link .